This tutorial shows how you can install Sun xVM VirtualBox on an Ubuntu 8.04 desktop. 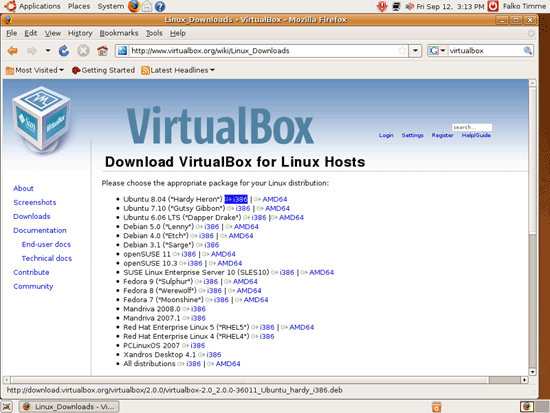 With VirtualBox you can create and run guest operating systems ("virtual machines") such as Linux and Windows under a host operating system. There are two ways of installing VirtualBox: from precompiled binaries that are available for some distributions and come under the PUEL license, and from the sources that are released under the GPL. This article will show how to set up VirtualBox 2.0.0 from the precompiled binaries. As of version 2.0.0 VirtualBox supports 32 and 64bit host and guest operating systems (if you want to install 64bit guests your processor must support hardware virtualization and, of course, the host operating system must be 64bit as well). Thanks for this nice post. I want to mention one point that is to use this one should be a member of the group vboxusers.